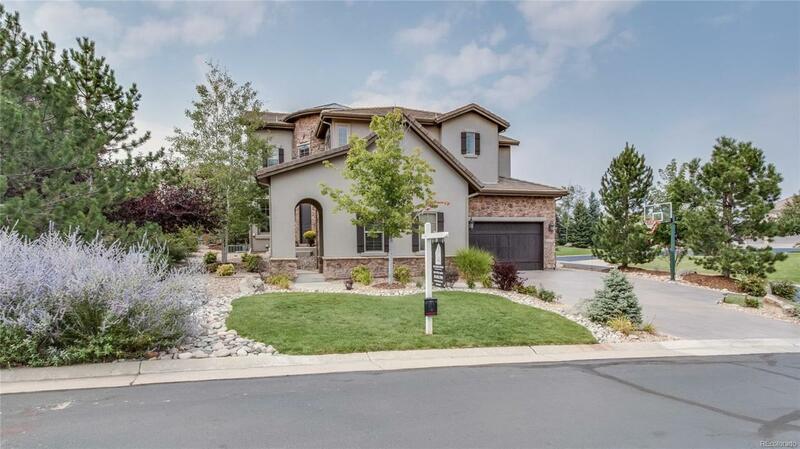 NEW REMODEL in coveted Daniels Gate area of Castle Pines has latest upgrades and finishes throughout, a designers dream can be yours. If you like the restoration hardware look, you will love this home with the latest transitional design enhancements PERFECT FOR THE GROWING FAMILY. All new lighting, new carpet, new paint, etc. Dark gray wide plank engineered hardwood throughout the main level. Light, bright Kitchen has white cabinetry, quartz counter tops with professional grade appliances, center island with room for 3 barstools. Kitchen opens to TV viewing lounge area which can double as a family eating area. A walk-in pantry and renovated mud room is situated through garage entry. A renovated contemporary see-through fireplace leads to the expansive two-story living room with floor to ceiling windows. A Formal dining room in addition to his and hers main floor offices complete the main floor. Beautiful curved stairway leads to the upper level which features 4 bedrooms.